What is ZEGO’s Affiliate Program? have an active network of friends, family or colleagues you think would like our products. If so, we invite you to become a ZEGO affiliate! This is how it works in a nutshell: First, you take 5 minutes to sign up as an affiliate through our website link. It will take you to our 3rd party platform, ShareASale. You’ll need to have a website or blog of your own to sign up. We will not be posting anything on your site; that’s just how ShareASale’s registration works. If you don’t have a website of your own to register with ShareASale, perhaps you can use the URL of a family member or friend (as long as it’s okay with them, of course). Once we approve you as an affiliate, you’ll receive a unique link that directs people to the ZEGO on-line shop. Share that link with everyone you know and/or your client base. When they use your link to buy ZEGO bars, ShareASale will track those sales and pay you 15% commission on every sale. ShareASale pays through direct deposit or check every month when you reach $50 in commissions. If you have less than $50, that amount rolls over each month until you reach $50. A free subscription to our monthly affiliate newsletter, packed with selling tips, inspiration, and new promotional information on sales and specials. A library of promotional graphics that you can share whenever and wherever you want. You’re welcome to share the graphics and your affiliate links on Twitter, Facebook, Instagram and Pinterest or on your website or blog. An earnings chart to show you exactly how much affiliate commission you can potentially earn for selling ZEGO bars. 24/7 access to your ShareASale account so you can track your affiliate earnings. An affiliate discount for you on any ZEGO bars you purchase for yourself (not for resale, of course). Affiliate marketing is a type of performance-based marketing in which a business (like ZEGO) rewards their affiliates for each customer sale brought by the affiliate’s own marketing efforts. How much does it cost to become an affiliate? ZEGO’s affiliate program is FREE to join. What affiliate system does ZEGO use? ZEGO uses ShareASale. Once you submit your name and email address, we’ll take you to ShareASale’s website where you can create an account and submit your request to become an affiliate for ZEGO. How do I, as an affiliate, earn money? How much money can I make as a ZEGO affiliate? The money you earn as a ZEGO affiliate is entirely up to you. For every ZEGO item you sell, you’ll earn 15% commission. Let’s say you set a goal to sell one new monthly subscription box a month. Your earnings will increase every month as your sales build on each other. Over a year, if you successfully sell one monthly subscription box every month, you have the potential to earn over $250 in commissions! If you know a lot of people, maybe your goal is to sell five new monthly subscription boxes every month. Your affiliate earnings will grow faster and, over the course of the year, you could earn over $1200! Of course, many people will buy single boxes but we use the subscription example because that is the best way for you to maximize your earnings and build your business with sustainable income. How were the earnings estimated? Each monthly subscription box retails for $21.99. Your 15% commission for each monthly box sold is $3.30. 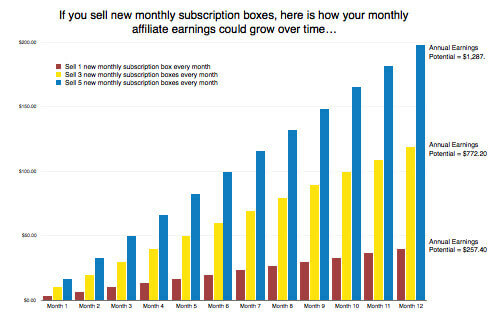 Here is a table showing how we estimated earnings potential for selling monthly subscription boxes. Is there a limit to how much commission I can earn? There is no earning limit — sell and earn as much as you want. Earn $10 a month, or $100+. The depth of your success is up to you! How often does ZEGO pay affiliate commissions? ZEGO’s affiliate commissions are paid via ShareASale. When you sign up, you will have the option of getting paid in one of two ways: via Direct Deposit or via check (which is mailed to you via USPS). The ShareASale system is configured to pay you your affiliate earnings once a month. Payments are made automatically on the twentieth (20th) day of each month when your account balance reaches $50 or more for the previous months’ transactions. If your affiliate earnings have not yet reached $50, ShareASale will hold your money until you’ve accumulated the minimum amount. After you sign up, we will send you instructions on how to set up your payment method. As an affiliate, am I eligible to receive a discount on products I purchase to use for sampling or my family’s enjoyment? Yes! We are sincerely grateful to our affiliates for helping us grow the ZEGO brand. After you successfully join our affiliate program, we’ll provide you a discount code that you can use to save 25% off your personal purchases. I have another question; how can I ask it? Feel free to email us at affiliate@zegofoods.com and we’ll do our best to respond to you within 24 hours. Join ZEGO’s affiliate referral program today! If you already have a ShareASale username and password, please login here.